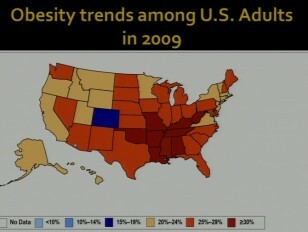 The aim of this presentation is to discuss the correlation between obesity and colon cancer. Obesity and colon cancer are meditated through four cellular pathways including: PI3k/Akt, IGF, Wnt/B-catenin, and Inflammation. It is the improper regulation of these four pathways, due to obesity, that lead to hallmarks of cancer that cause carcinogenic pathologies associated with the colon.